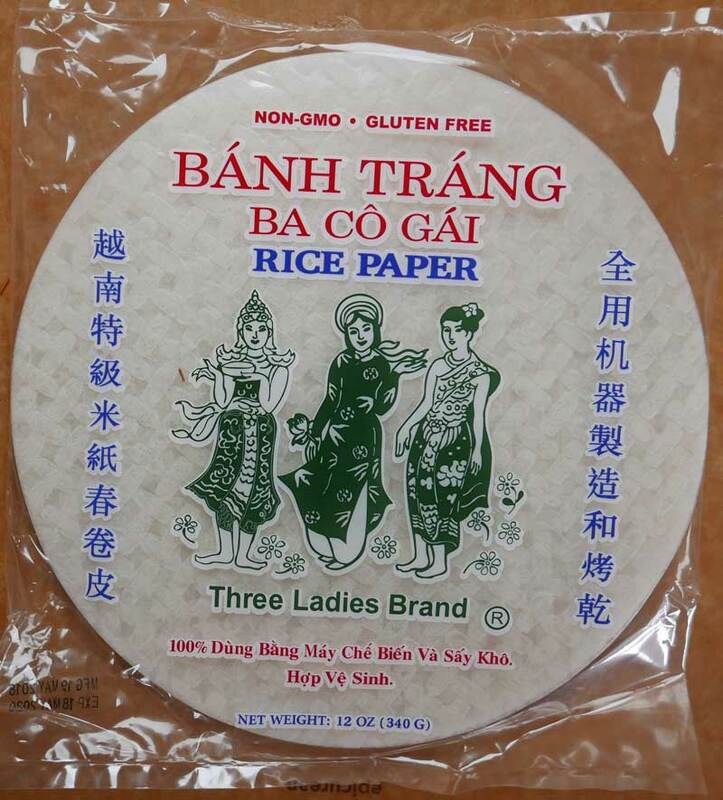 High quality spring roll wrappers made from a mixture of tapioca flour, water, rice flour and salt. These are rolled out by machine to paper thinness and then dried on bamboo mats in the sun. We offer the most convenient size: a nice 8.75" in diameter which is easy to work with. Our premium wrappers are not too thin and not too thick. Used for wrapping Vietnamese spring rolls of pork and seafood, with crispy fresh lettuce and herbs and finally dipped in a special sweet chile sauce for spring rolls. See our useful recipe and photos below. Useful Hints: wrappers must be softened before use. Simply immerse them, one or two sheet at a time, in warm water. Soak them until they are soft, approximately 1 minute. Handle them carefully as the sheets are brittle. Drain them on a linen towel before rolling. For a different dipping sauce, we like: a mixture of 1/2 cup Hoisin Sauce, juice of one lime, two crushed Thai chile peppers and several cloves of crushed garlic (use a mortar and pestle to crush the chiles and garlic). See the recipe below, also try this recipe for Fresh Fish Spring Rolls. Each package has approx 40 wraps. All natural, and dry so they last forever in your pantry, will not go bad. Ingredients: tapioca flour, water, rice flour, salt. Fresh rolls are healthy and delicious, and the fruity tamarind sauce adds super flavor character. Thai-style fresh rolls are called po pia which is a Chinese word, so this is Chinese style which became popular in Thailand. Vietnamese fresh spring rolls are more commonly enjoyed in America, so you might be more familiar with them. This version is typically what you find in Thailand. Don't be afraid to pop them in the microwave and serve warm. Vegetarians can easily leave out the pork and shrimp, and use shiitake or other mushroom. Though we did not use them in this recipe, often are added to fresh spring rolls. Just soak for 5-7 minutes, and add a small amount to the mix. Also see: recipe for fried spring rolls.